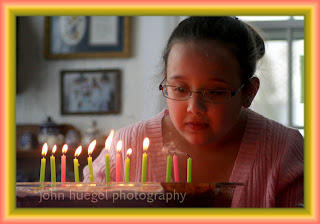 Happy Birthday to my niece Abby who turned 12 this week! 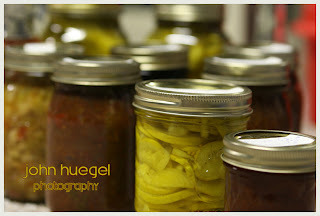 Tech: ISO800, DRebel, 1/250 at f/4.0, no flash. Nice window and candle light! 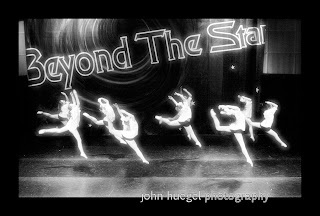 This shot was taken from a competition in 2008 held in Youngstown Ohio. These 9 ladies were performing to “My Skin” by Natalie Merchant. This very emotional lyrical dance matched well to the music. 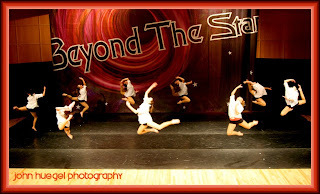 Having watched the number many times (with two of my daughters among the nine), I was able to anticipate a few of the great moments in this performance, and capture images of their leaps. In this shot, everyone is airborne, and they are almost perfectly synchronized with each other. The entire leap from launch to landing is under a second. To have this degree of timing among nine people who cannot see each other is truly amazing. I call it a Matrix Moment – when it looks like you have frozen time and you can walk into the frame and view it from any angle, like the “bullet time” work in the movie The Matrix. I like to capture a few of these each year. The more people in the frame the better. This was a fairly well lit stage, but I still had to shoot ISO800 f/2.8 at 1/125 second to stop their motion. Even at that exposure there is still some blur at their hands and feet. It’s a pleasure and honor to photograph these dancers. It’s amazing to see these ladies behave so professionally, so focused, for so many years. Yesterday was not the best day for photos, with the severe weather. My daughter Jennifer had her winter Semi-Formal dance and had some friends over before the event. I took the opportunity to capture some indoor images with my new Gary Fong Lightsphere. This light modifier, attached to the top of an attached flash, reportedly softens the light. And it did a fine job, as you can see here. Shooting at ISO640 and 1/30 second exposure, the TTL flash nicely balanced the available light and preserved the warmth of the room. You can see just a touch of very soft flash shadow on the wall just to the left of Jenny’s head. This is much softer than I would have expected with a camera-attached flash. I did notice some illumination falloff issues with larger groups, but that is to be expected. Overall, a good experiment and a very photogenic subject! Here is another high-key image of a dancer. This image shows Chelsea’s amazing flexibility and balance. Many of these dancers spend 10 hours or more in the studio each week, honing their flexibility, strength and dancing skills. The ladies at this studio study tap, jazz, ballet, hip-hop, acrobatics, adagio and often memorize ten to twenty dance numbers per year! They participate in dance groups from solo to very large production numbers. It is an honor to be able to photograph these great dancers! We’re getting close to dance photography season. Each winter, we capture images of dancers, in costume and sometimes in motion! This image was from a special session that I do only for the competition teams – high key photography against a white background with lots of light. I shoot high key with four lights: Two for the backdrop to blow it out, and a main and fill light in the front. You can see from the shadows of her arms cast onto her legs that the front lights were on either side of the camera and the light to camera right was the higher intensity main light. Heather here has jumped about as high as she is tall. I left a bit of detail in the white background so she wasn’t floating on thin air. It’s great to be able to capture the energy, art and motion of dancers and see the smile on their face when they see a perfect image of themselves. 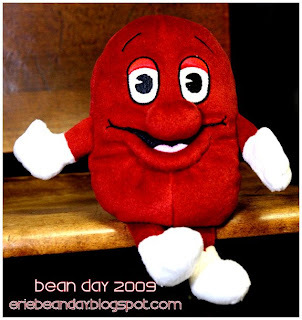 Erie Events: Bean Day 2009 Is Coming! Yes boys and girls, the great midwinter food celebration is back! This time with more beans! What started off as a fund raiser for the Second Harvest Food Bank focusing on SPAM has turned beany. When the SPAM folks politely declined to allow us to use their product in a food event, they missed out on a great thing. So we have resurrected Bean Day! Bean Day is an invention of my dad and stepmother, who, years ago, started bean day as a friends and family midwinter cooking celebration and a reason to get out of the house in February. Over the years it grew in popularity and at one point took over a fire hall, and this with no communication other than word of mouth. The lowly bean is a wonderful base for cooking. At Bean Day we celebrate all that can be associated with bean, from pure bean-based foods such as baked beans, to things made with beanlike substances like Tofu, jelly beans, vanilla beans and coffee beans. Yes, we stretch the definition so we don’t have to eat pinto bean ice cream. The highlight of Bean Day is the cooking contest. People are invited to bring an entry to be judged and shared, and the winners come away with incredible prizes like more beans. More details will follow. We would like to raise $1000-2000 for the Second Harvest Food Bank. Wedding Photography: Album, Prints or Digital Files? 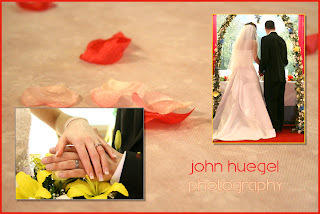 One of the key decisions you will have to make as you plan for your wedding is your photographs. Will you want a formal album? Or will you forgo the album and purchase only prints? Will you ask for the digital files and try to make your own? Will you scrapbook your wedding with mementos and images together? Wedding albums have come a long way since the days of film. Most professionally made albums are laid out using design software, allowing unique presentation and collages of images that were not possible just twenty years ago. Flush mounting, lay flat books and unique finishes all come together to create stunning images of your special day. The choices for printed memories can also extend to other formats and price points. New press printing technology allows affordable coffee table book designs using heavyweight book paper in traditional bound and lay-flat designs. Some wedding couples may find that this option is a nice balance of economy and style, as these are often more affordable than a traditional album, and a coffee-table book may remain out on display more than the large wedding album. If you have a “do it yourself” spirit, you can build your own albums or scrapbooks using prints or proof images. If you are going to go all the way and request digital files, be warned that the print quality and final image editing of a professional photographer and their lab will be very different than the prints you will get if you take the disc or files to your local discount store. And sometimes the best laid plans are set aside. Many brides never get around to building that album, and years after their wedding, they have nothing to show for it. So before you commit to an album plan, talk it over with your family, fiancee and photographer. You have just one chance to capture and preserve the images from your wedding day. Make certain that you will end up with a treasure that you will be proud to show off!